These folks said, "Ain't nobody got time for that!" What's the running joke about black folks in horror films? Oh yeah! We are the first ones to get hacked by the slasher. It's so bad that we aren't even surprised when it happens anymore. On the contrary, however, there are some black characters who debunked that theory that black people will essentially die before their white counterparts. From thrillers to slasher movies, here are 13 black actors who weren't about that life and made certain that in their contracts they were listed as one of the final girls or guys. 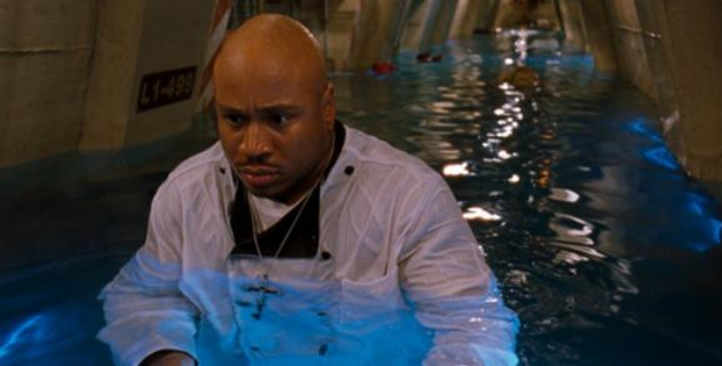 Let's face it, LL Cool J couldn't get eaten by a shark because he's just too cool for that. It's in his name. And if we can assume correctly, it was probably in a clause in his contract too. Considering that the scientifically modified sea predator had already swallowed another black character whole (Samuel L. Jackson), it was only fair that though LL Cool J's character, Preacher, sustained some brutal injuries, he outlived the non-human but vicious killer, and several of his white co-stars. Not to mention, they were the scientists and he was a chef. Anaconda was a different kind of horror movie franchise that didn't die off quickly, but did as painfully as its characters. Instead of a serial killer in a mask or demonic entity, ungodly sized snakes picked off a National Geographical film crew one by one in the story's first plot. Within the crew were explorers of different races, but once audiences saw Ice Cube, a black man, take the screen, we assumed it was only a matter of time before he died. We were wrong. In fact, Ice Cube, who played Danny Rich, only signed up because he knew he wouldn't be among those who met their demise in the film. "I've done movies for certain reasons; I did Anaconda because the black man lives. Simple. The black man isn't dead in the first three pages, like Jurassic Park. It's like, 'The black man kills the snake with a Latino girl? Damn! I got to do this." With on-the-edge plot twists and turns, audiences were more than likely at about a 50/50 vote of whether Chris, played by Kaluuya, would make it out of the Guess Who's Coming to Dinner from hell, Get Out. Compared to the alternate ending that the mastermind behind this genius "social thriller", Jordan Peele, had written, much, if not all, of the black movie-watching populace was elated to not only discover that a black man had not only survived a horror film, but more so that he reclaimed the distress and trauma the white agonizers had put him through by afflicting revenge on every single one of them in the close of the movie — without saying a word. As the youngest cinematic experience on this list, it just goes to show that black filmmakers and actors are diminishing racial typecasts that the only black people in horror movies have to be the innocent bystander or token friend of color, and shifting the narrative for victims in these flicks by taking control of their situations and saying, "Not today." Though his character, Ronnie Heflin, came face-to-face with the killer in the second act of the film, and most of his friends and his girlfriend, supposedly soon-to-be fiancé, were hacked by the lunatic on the loose (leaving him completely clueless until the end), Pennie survived all the way through to the rolling credits. Granted, Prom Night did not score big at the box office or even in reviews, but the fact that Pennie never even got into a scuffle with the killer in the first place is quite baffling, yet refreshing at the same time. In the final act, Pennie was left sitting on the curb outside the hotel dazed, confused and heartbroken of how his life had toppled on its head. Thankfully, he hadn't. Brandy was America's sweetheart at this time in her career. She was the first black Cinderella and even had a Barbie doll designed after her likeness. Producers knew that they could tease the idea of America's sweetheart begging for her life in slasher sequel, but they would probably have been met with dissatisfied Norwood fans and pitchforks if they killed her off on screen. The fact that she was a black actress added the cherry on top. Surely, the sequel wasn't as promising as the first (though that one wasn't a classic either), but it was worth however much you spent at the theaters to see our beloved Moesha make it out alive. If you say that this movie didn't give you the creeps when you were growing up, you're probably lying. With Jada Pinkett-Smith's character as the interest of the film's antagonist, it only made sense that our favorite five-foot feisty killed it on the screen without getting killed herself. Then again, if you put Pinkett in any horror movie, could you really imagine her becoming a corpse, a victim of a soulless psychopath? Nah. And if she did, the famous actress wouldn't go down without a fight that would be remembered in cinema for years to come. Hodge's character came a long way from being slated "Bloody Stranger" to fan-favorite "Bishop" in the Anarchy (2014) and Election Year (2016). Bishop went from homeless victim in the first film to a Purge savior in the following films up until his demise. The idea of him reclaiming his role for multiple sequels speaks volumes of how his portrayal was highly received by fans. Imagine what that would've been like if they killed off the beloved anti-Purge rebel. Surely, the critics ripped into this feature far more than the evil entity did in the entire 98-minute runtime, but if Halle Berry, an Academy Award-winning black actress solved the mystery in the crime thriller in order to save her own skin, it's worth sharing. When you think of Loretta Devine, movies like Waiting to Exhale and This Christmas may come to mind, not Urban Legend. But if you recall, the late '90s slasher starred Devine as the witty and hilarious campus security who always kept it real and gave us a memorable cinematic quote that added a little comedic relief to the haunting picture, and teased the title of the film. Se7en, a must-watch for cinephiles, is beyond the normal level of disturbing, whether one would count it as a horror or psychological thriller. As one of the highest grossing and most commonly cast actors in films (not just black actors), it didn't come as much of a shocker that Morgan Freeman didn't die in the '95 gruesome classic. As a matter of fact, his fate turned out 100 times better than that of his partner, Mills (Brad Pitt) and his wife, Tracy (Gwenyth Paltrow). So if you have never brought yourself to gut up and watch the gut-wrenching mystery, at least you can turn it on knowing the brutha survived. As Simone Bethson, a black character in one of the goriest horror franchises, Howard was able to reappear in the following sequel Saw 3D as she not only survived Saw VI, but was the remaining victim in Jigsaw's perilous and disturbing game. Though she was left brutally injured and traumatized by the bloody choices she had to make in order to "win", it was refreshing to see a black actress be the last man standing. Many would argue that a black person going on a deadly expedition to Antartica in the first place isn't realistic and therefore, Sanaa Lathan's character, Lex Woods, (the environmental technician in the first film of the AVP series), would ultimately, without a doubt, be killed off before audiences could even learn her name. They would be wrong. Woods managed to not only be the sole survivor of her expedition, but go toe-to-toe with the Xenomorph Queen in the final act. Lathan's beauty, on-screen charm, and superb acting chops landed her the coveted role of the final girl to kick off the sci-fi horror franchise. It was all the more a reward to black horror movie fans that this final girl was from our community, and a badass at that. Just the look on old boy's face screams, "These white folks tryna get me killed." As Courtney Cox's cameraman, Martin's character, Joel, was not about that life, giving us one of the most honest and hilarious lines in horror film history: "Brothas don't last long in these types of situations." It always tickles audiences when the character in the film says exactly what the rest of us are thinking. It's because of Joel's common sense and no-BS having mindset that he stayed alive in the blockbuster. For decades, token non-white characters in horror films have followed a group of white friends to their doom, even with all of the warning signs. At the end of the day, when the credits roll, it's sometimes nice to say, "I'm just glad the black guy didn't die first."